I ran out of stickers? Please contact your local Saskatchewan Royal Purple Association contact. 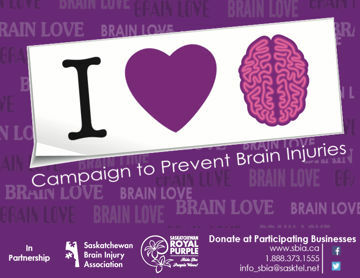 Your local Saskatchewan Royal Purple Association contact can be found on the back of the BrainLove Brochure or Business Instruction Card. If the back of those items is blank, please contact the local SRPA Lodge, or the Saskatchewan Brain Injury Association at 1.888.373.1555. When will the final donation be collected? The final donation will be collected on April 1. I will not be able to provide the donation on April 1? Who should the final cheque be made out to? The final cheque should be made out to the Saskatchewan Brain Injury Association. Please provide a cheque where possible, and avoid providing cash.